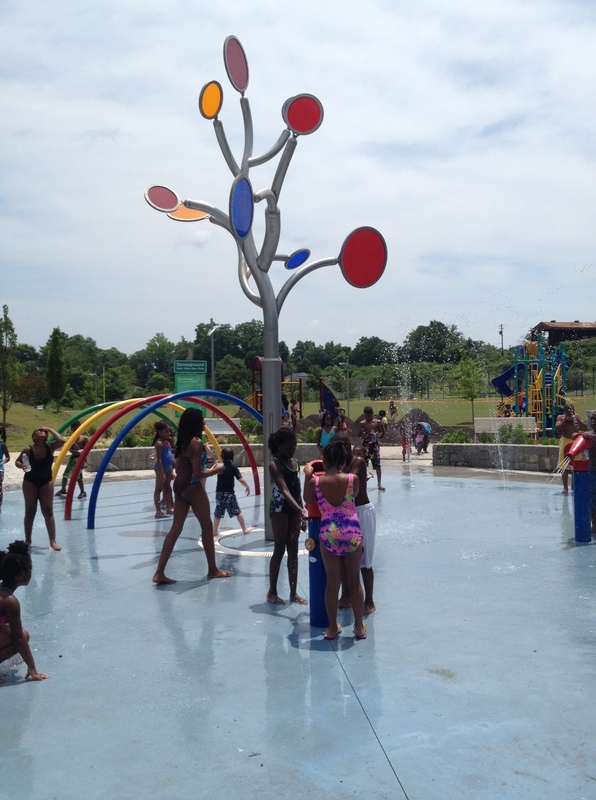 Stanton Park is clearly a much-needed oasis for the children of Peoplestown and the surrounding Southeast Atlanta neighborhoods. Perhaps I’m just in a contemplative mood, but it also seems to perfectly engender the sum-total of current life and modern issues in Atlanta. Stanton Park itself is a shining example of everything-one-could-want in a community space and clearly no expense was spared. Hallelujah, there’s even a bathroom! On this hot Friday afternoon, the park and splash pad were literally overflowing with children. Every section of the park was not just in use, but thronged with children. The one prophetic exception being the baseball field, laying dormant like so much of America’s old-fashioned fields of dreams. I do not shrink from a crowd, I often even delight in one, but even I was a bit overwhelmed by the sheer numbers visiting Stanton. “How crowded could it really be?” you ask. The line for one slide alone was 25-30 children deep. It was so crowded children could not play, only wait in deep lines on nearly every play structure. We lasted about one hour before my 4 year old, who has waited through restaurants in Paris and in lines at Disney, threw in the towel and was ready to leave. I found myself asking familiar Southeast Atlantan questions like “Why hasn’t this area gotten something sooner?” and “How long will a park like Stanton last if used so heavily but not well maintained?”. The pessimist in me echoes that I have seen too many quiet, underutilized parks in “nice” neighborhoods and yet there never seem to be enough parks in poorer neighborhoods where they are used most. As a modern Atlantan, I feel it is important to try not to hold on to too much of the past but to try to spend most of our time focusing on the present and the future. With that mindset, Stanton paints Atlanta’s future as bright indeed. 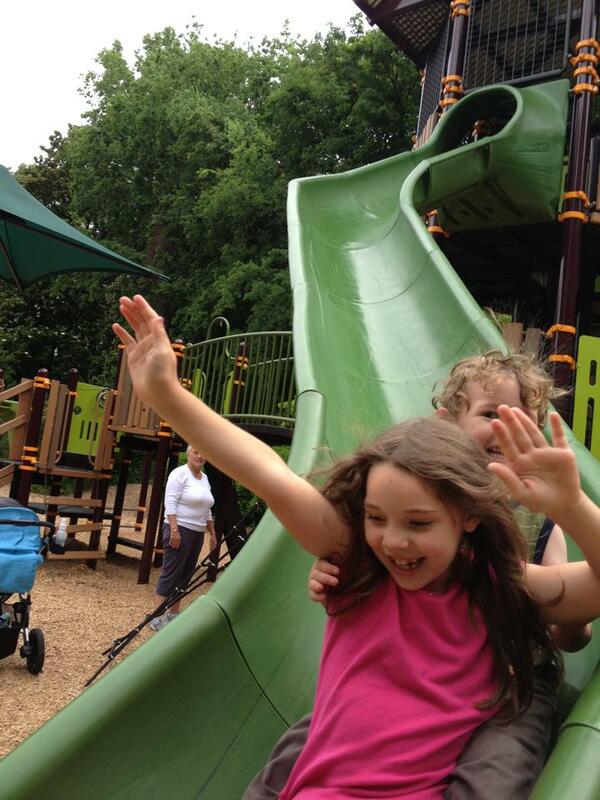 Full of shiny new playgrounds and thronged with Atlanta’s future adults. But the realist in me thinks that I won’t return to Stanton as often as I’d like if the throngs and my thoughts after visiting are bigger than the park itself. After taking our summer vacation, Summer of Swings is back! This time we checked out Lake Claire Park. Lake Claire Park feels like an attempt to cover too many bases in a small area. The field area features 2 in-new-condition soccer nets with space beyond to set up equipment for other sports. Picnic tables, benches and playground are conveniently located beside the field. If you need a quiet, open and local field for that pick-up game or to teach your kids frisbee, football, baseball, practice soccer, etc. then Lake Claire may be useful. Otherwise, I see little reason to go out of your way to visit this park. SHADE: none…beginning to wonder why I even have this category since every playground seems to lack it. ACTIVITIES: baseball pitch/hitting practice, soccer practice, frisbee, tennis, any field-based games that you would care to set up (volleyball, badminton, football, croquet). I think Poncey-Highland Playground’s odd location (in view of a semi-major highway, Freedom Pkwy) keeps it from being more frequented. Rest assured, Parents, the playground is positioned well away from the fast moving cars on busy Freedom Pkwy. There is even a bit of fencing to serve as a convenient visual cue for young children located at a very comfortable setback from the street. But the aforementioned location issues combined with several out-of-view garden areas so near hobo-heavy Ponce De Leon coupled with the lack of immediately obvious parking can leave outsiders feeling uneasy to visit. If you can get past these obvious downfalls, Poncey-Highland’s equipment is fairly new, in great condition and especially good for toddlers. Plus, it’s playground can serve as a convenient starting or ending point for larger exploration of Atlanta’s first “beltline” – PATHAtlanta. 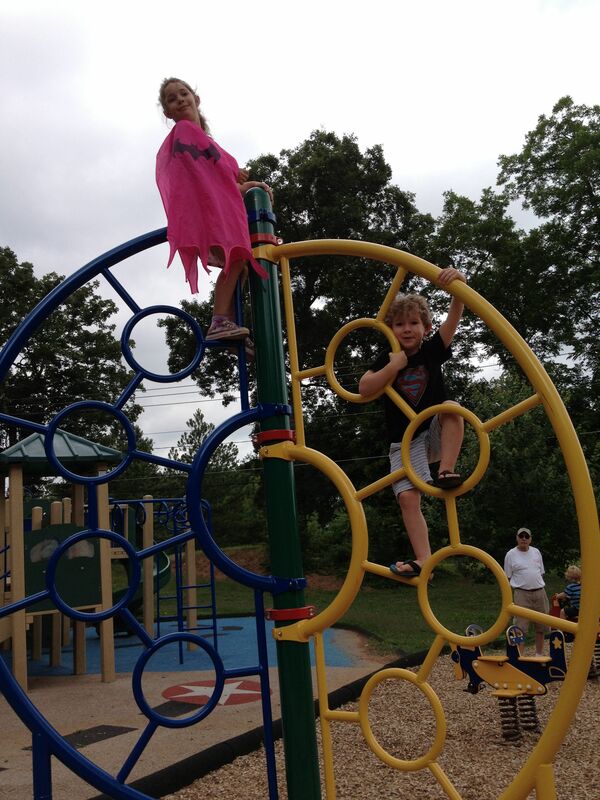 Consider Poncey-Highland playground as a good stop on the way to (or from) Publix or on the weekend as part of a larger day exploring the PATHAtlanta trail and you may find a lot to like there. LOCATION: Corner of Freedom Pkwy and North Ave. Best parking for playground is on Linwood Ave, just off of North Ave. If you drive one block down Linwood Ave, there is convenient access to the PATHAtlanta trail there. Make the first right on the trail, follow the short downhill walk to the playground. AGE RANGE: infant – 6 years. Especially good for toddlers. EQUIPMENT: 2 toddler-sized play structures with slides over soft rubber ground. Climbing structure. Set of swings (includes infant swing). Fairly new, good condition. Benches beside playground. Water fountain and dog bowl. ACTIVITIES: Bike rack nearby. Playground directly connects to PATHAtlanta, extensive series of paved trails perfect for biking, scootering, stroller jogging or roller skating. OTHER: Many wildflowers in the unkempt green space, perfect for flower pressing/picking as well as butterfly or bug catching. Nicely landscaped gardens surround the playground, community garden at top of hill. I’m getting off to a grand start! We discovered Springvale Park today. Tucked away in the Inman Park neighborhood, I had no idea such an idyllic park sits but a short 5 minutes’ drive from my house. Covered on nearly every side with dense bush and old growth trees, it’s easy to see how I might have missed it. In fact, I was actually on my way to another park when I barely made out the tell-tale colors of a playground in between leaves and decided to turn around to investigate. Oh happy day that I did! In addition to one of the best playgrounds I have been to in a long while, the grounds are fantastic. Springvale is a terrific place to find urban wildlife. There is a small pond housing geese, ducks, bull frogs, large koi, fish and turtles which sun themselves and idle on floating debris. The dense plant growth which protects the edges of the park is home to chipmunks, squirrels, numerous birds and who-knows-what-else and isn’t afraid to come into the open to be seen. EQUIPMENT: Features a 3-story tall “tree house” with slide descending from both the third and second floors. Has every one of my “big 5” of playground equipment: swings, slides, ladders, monkey bars, see-saw. OTHER: There are few benches near the playground, bring a blanket if you’d like to be near it. As much as I love my ‘hood, the Grant-Ormond Playground is a good example of what the South side of Atlanta has endured in the past. Issues of under-utilized, under-funded and forgotten playgrounds are what kept Atlanta at the bottom of so many “healthy city” lists in the 1990s. On a positive note, Atlanta is awakening to the importance of green spaces to the surrounding community. SHADE: none on playground, but many shade trees nearby. EQUIPMENT: Old painted iron equipment, consisting mostly of ladders and monkey bars. It takes a lot for me to consider a playground unsafe, and I would consider this one somewhat unsafe. One of my children gets hurt every single time we go to Ormond-Grant. The nearby benches need replacing. OTHER: Although the equipment needs an upgrade, the surrounding green space is well maintained and nice. There is a nice deep lawn which is often cut, many benches and good shade trees. This would be a good spot for older kids to free range or good to hold a small party or playgroup for older children when you want the feeling of having a whole park to yourself.